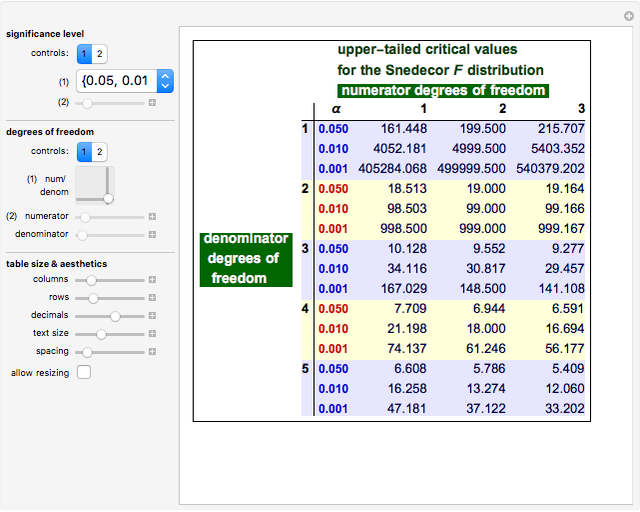 The distribution of modern statistics (also called the -ratio or Fisher-Snedecor or Snedecor's distribution) is a two-parameter continuous probability distribution arising out of the ratio of pairs of random variables, each divided by its own degrees of freedom. The distribution plays a very prominent role in classical hypothesis testing in econometrics and statistics as the null distribution of the test statistic in tests of overall model significance and tests of joint linear restrictions generally, in the analysis of variance, and in likelihood-ratio tests. The distribution has two parameters, its numerator degrees of freedom and denominator degrees of freedom, which are the degrees of freedom of the numerator and denominator variables defining the variate. The distribution has domain and shape, variance, and location (or mean) that varies with its two parameters, although the mean (when defined) remains in fairly narrow bands (unlike the ), such that an -statistic of 5 or 10 constitutes a large number from almost any member of the distribution family excluding denominator degrees of freedom less than 10. Because the distribution is a two-parameter distribution, printed tabulations of critical values for classical hypothesis testing are necessarily large and heavy or very incomplete. 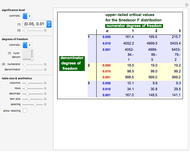 For chosen significance levels and chosen numerator and denominator degrees of freedom this Demonstration provides a live scrolling table of right- or upper-tailed critical values. Essential functional controls consist of two means of choosing the significance level(s): (1) a drop-down menu offering various groups of and individual significance levels and (2) a slider for scrolling from 0.000 to 0.9999 in increments of 0.0001; as well as two alternative means of scrolling through the table, that is, changing the numerator and/or denominator degrees of freedom: (1) a 2D slider for scrolling by row and column simultaneously and (2) two individual sliders for scrolling by row or column individually. Amongst functional and aesthetic features you can also control the number of decimals reported for critical values, the number of rows and columns of the table shown, as well as text size and spacing, while also choosing a fixed table size or allowing the table size to automatically adjust to the size of the table contents, including the number of rows and columns. 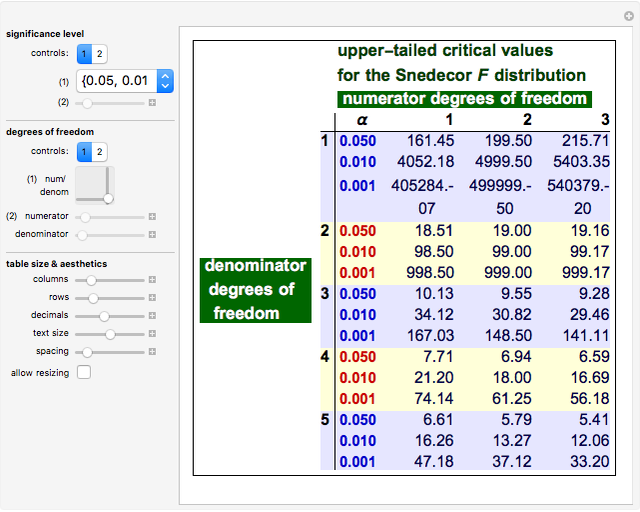 This Demonstration is not primarily an instructional or educational tool nor a Mathematica illustration; instead it is intended to be a useful practical tool for students and researchers in need of a critical value. 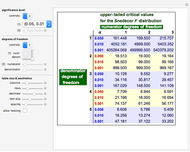 It is a far more comprehensive and efficient alternative to the standard tabulations in use around the world (usually included in all statistical and econometric textbooks) and to existing web-based calculators and simulators of critical values for the distribution. A.C. Darnell, A Dictionary of Econometrics, Brookfield, VT: Edward Elgar Publishing, 1994. D. B. Owen, Handbook of Statistical Tables, Reading, MA: Addison-Wesley Publishing Company, 1962. M. Trott, The Mathematica GuideBook for Programming, New York: Springer-Verlag, 2004. 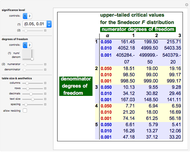 Jim R Larkin "Upper-Tailed Critical Values of the Fisher-Snedecor Distribution"